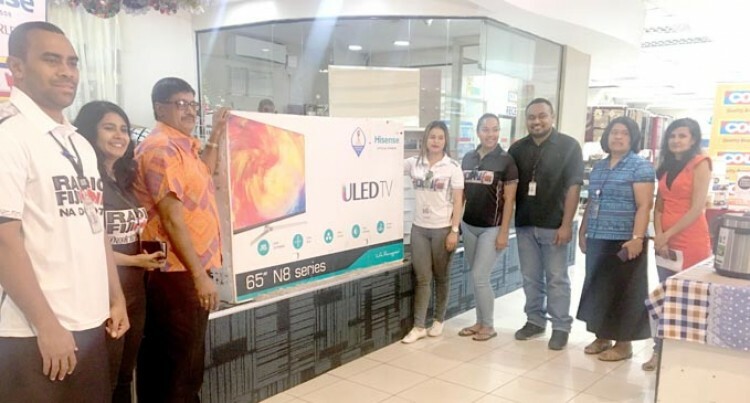 The winners of the Hisense 65-inch Smart LED television, Walesi and an­tenna have told how they had never won a prize, let alone a big television set. Domestic worker, Zahira Nisha from Cuvu, Sigatoka, was one of the winners in the Courts promotion draw yesterday at Rod­well Road in Suva. “I am extremely happy to win a television. I never thought I will even get a chance to win,” she said. Plumber at Concrete Solution, Dickson Ste­ven from Lami, said he had initially thought of buying a television. But with his massive new television, it seemed like an answered prayer. “I am very surprised right now because I have never won in draws and I think today God was by my side,” he said. The other four winners are Mohammed Khan of Nadi, Harbans Singh of Ba, Sayed Hussein of Ba and Nitya Nand of Nadi. The draw is part of Courts 2018 Hisense FIFA World Cup promotion. Hisense was an official sponsor of the World Cup last month in Russia and Courts is the main distributor of Hisense products in the country.